Helping companies and their people find the nexus between profit and purpose. Could your organization use some Full Value? Full Value is an innovative and powerful learning experience that draws participants into the workings of the Full Value Life Products Company (Full Value) and its stakeholders. 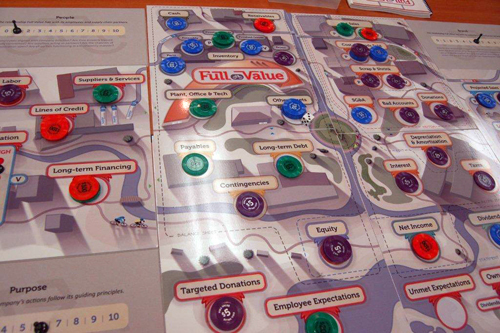 Full Value is a team-based financial simulation that follows a fictitious bicycle and healthy lifestyle company. When people step into a leadership role for the Full Value organization, they learn vivid lessons about budgeting, capacity, market share, customer relationships, and building partnerships with employees and the marketplace. The business metrics that participants learn are at both the enterprise level and at the manager level. Did we mention that this robust learning experience also is a lot of fun? In one or two competitive rounds, participants compete with each other to generate business results for stakeholders while adhering to the company cornerstones of People, Brand, Profit and Purpose. Full Value can run from four to more than 12 hours. It’s customizable, too, as we can align the learning to your company’s financial and business specifics. We have versions for public and privately held companies as well as companies that stress charitable contributions or other long-term imperatives as part of their mission. Full Value can be modified or fully customized to meet your company’s unique needs. We can deliver the program as is, modify transactions and metrics or completely rebuild the content to mirror the realities of your company and industry. We can facilitate the program for you or train your trainers to deliver it on their own. Establish and create business alignment into purpose and thought. Align business decisions to a company’s indicators of success such as people, brand, profit and purpose. See how companies make difficult decisions with limited resources. Prepare and interpret basic financial statements. Distinguish cash flow from net income. Understand key financial ratios and use them to analyze results. Tie together the supply and demand side of a company’s business model. Use increased business knowledge to make more effective decisions. Contribute to the departmental sales forecasting and budgeting process. Ready to take your people deeper for an even more comprehensive learning experience? Like its successor, Full Value, Full Throttle focuses on business results; however, Full Throttle spends more time going through one business cycle and helps learners make real connections to the world of finance and their own companies. Full Throttle was developed in 2004 and was named Best New Training Product by HR Executive Magazine in 2005. It has been used by companies all over the world (directly by Solutions House and our partner, the Corporate Executive Board) and has been delivered in both English and Spanish. The learning experience runs in two sessions: Controller and CEO. In the Controller session, learners dive into the financial and economic operations of a fictitious motorcycle company. They explore how financial results are recorded and how suppliers and customers interact with the company to help everyone succeed as they work through the supply chain. Full Throttle Controller is built on principles of active learning and allows the learner to see the physical flow of dollars in and out of the company before putting numbers to paper. This methodology is proven to increase knowledge and retention. And, of course, learners are encouraged to make connections to what they already know and draw out important insights about their organizations’ strategy and finances. In the second session of the Full Throttle program, CEO, participants are “promoted” to CEO and are tasked with setting the strategic direction of the company as they manage short-term financial concerns, the demands of the board of directors and the volatility of the stock market. While the two programs are similar, they also are different in some respects. Full Throttle requires heavier facilitation and introduces participants to financial concepts at a slower pace. Full Value puts more control of the learning process in the hands of participants (though Full Throttle is still mostly participant driven). Full Value includes a look at divisions within a business as well as owner expectations and special targeted spending such as employee bonuses and charitable donations. In Full Value, participants prepare more financial statements and do more investment analysis. Full Value also offers competitive rounds for participants to enjoy. We can customize our programs in a number of ways, from changing metrics to building new transactions to creating new content to bring your company’s toughest challenges to life. We have developed versions for specific industries and customized the mechanics to show the financial and commercial levers for some of the most influential organizations in the world. We can do the same for you.